Club Penguin Cheats by Mimo777 Club Penguin Cheats by Mimo777: Black Friday on ClubPenguinGang.com! Click here and click "Follow". Click here and follow the directions and I will follow YOU! So what does this have to do with Black Friday? Not sure. If you come up with anything plz post your idea in a comment. LOL! You can't celebrate Black Friday, since you don't sell anything. It is a day for discounts. I know mimo! We could have your cp party! GLITCH: if you give a tour at the dock it says weird stuff. Mimo! They changed the start up screen! Everything is ninja like and remember the agent in the light house? There is a water ballon insted and there is a ninja! SO COOL! Hey, mdog! Black Friday is the day after Thanksgiving in the United States. It is a day were many stores have giant offers and sales. Usually they open very early, sometimes at 5 A.M. It is very crowded in stores! Let's go on CP and put on black clothes! Me too but i'm thinking about doing an event on club penguin!We gather up in any place and do a party!The best igloo owner will be my club penguin buddy,and when u are my buddy you get to act in a Club Penguin video!!! have a surpise cp party! Okay, so in my stamp book, it has the Card-Jitsu Fire section, but even though I am a Fire Ninja, no stamps show up! its pretty much a day when stores have big sales. If a water ninja has all the stuff, then they make a cool trick. Black Friday is when all the stores have crazy discoutns up to almost 80% off and people camp out for days wait for it. OMG it's a party hint guys! Figure it out! Cool. In Australia, we don't really like Black Friday, cuz its every Friday that is the 13th, and that day its supposed to give us bad luck. 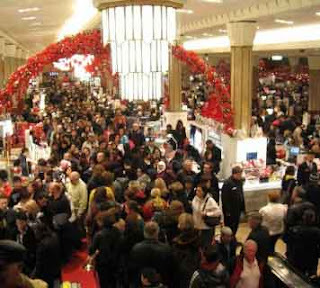 black friday is a day in america where they have like really big discounts on everyhting and people get up at like 2:00 to start shopping to brag about there deals and to get items in stores before they get sold out.